German-made Fliegl is known for being the largest manufacturer of specialist trailers in Europe. 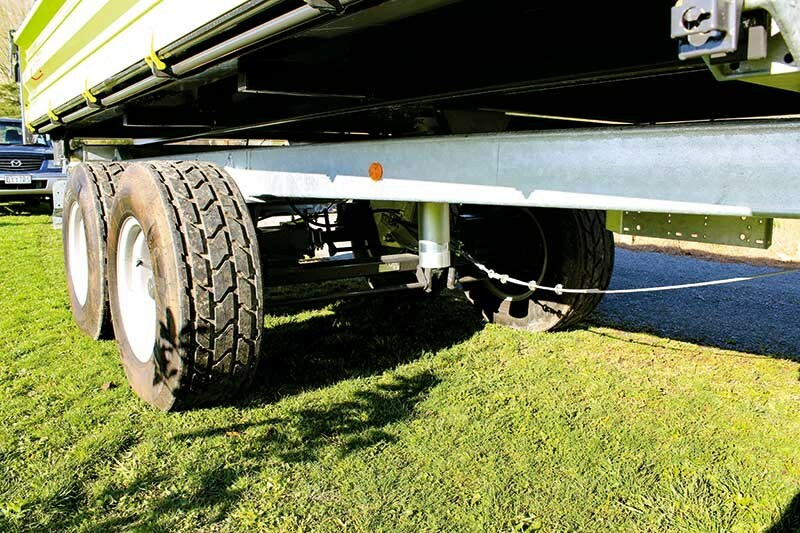 BRENT LILLEY takes a look at the TDK 110-88 three-way tipping trailer in New Zealand. 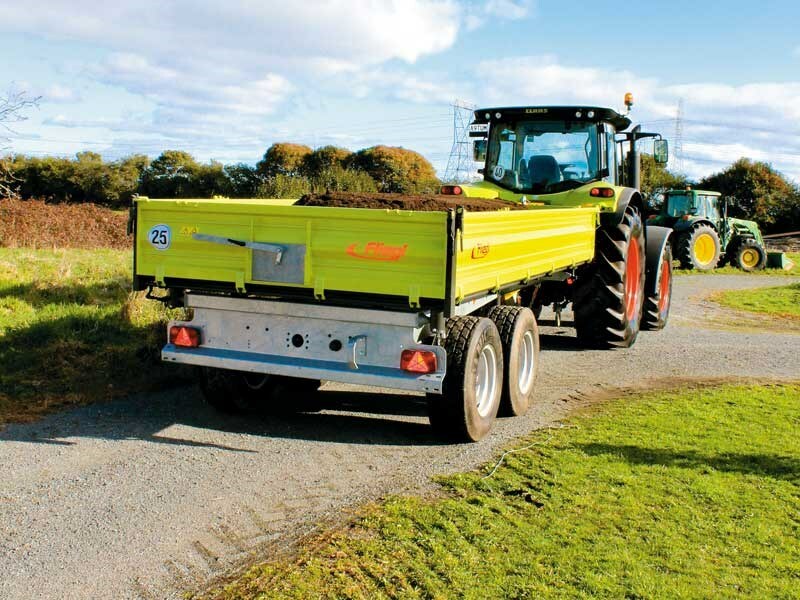 Brought in from Europe and sold and serviced by the Claas Harvest Centre network acorss Australia and New Zealand, the Fliegl TDK 110-88 is an 11-tonne trailer that sits in the middle of the range, which also includes eight- and 14-tonne models. 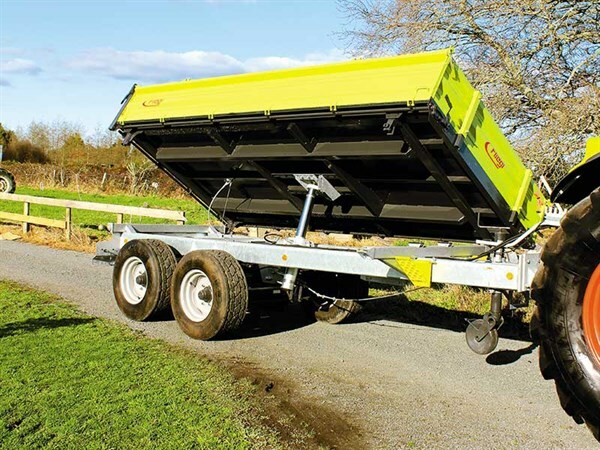 These trailers are built to a very high European standard and are fairly unique due to their simple, easy to operate three-way tipping that comes standard. 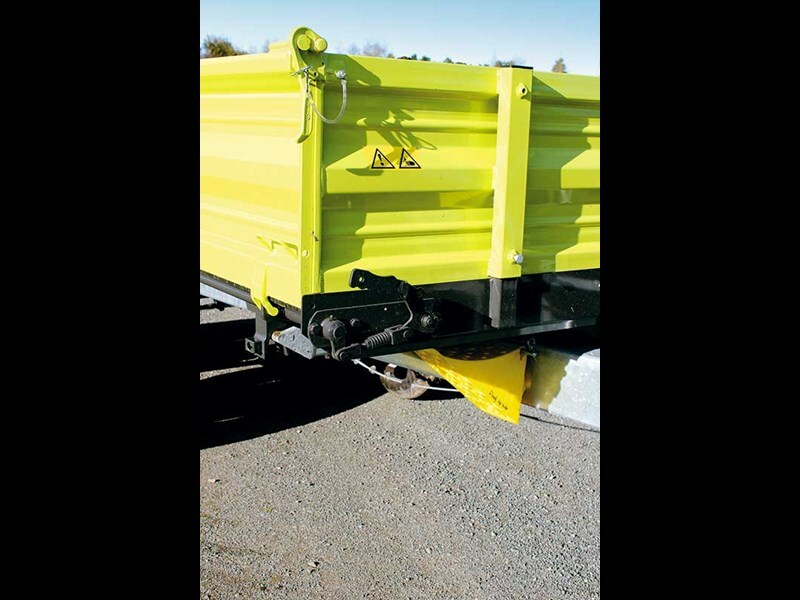 The backbone of this trailer is its triangle shaped chassis stretching from the drawbar to its rear corners. It is built out of true box-section as opposed to welded channel iron to prevent twisting, and its hot dip galvanised to resist corrosion. 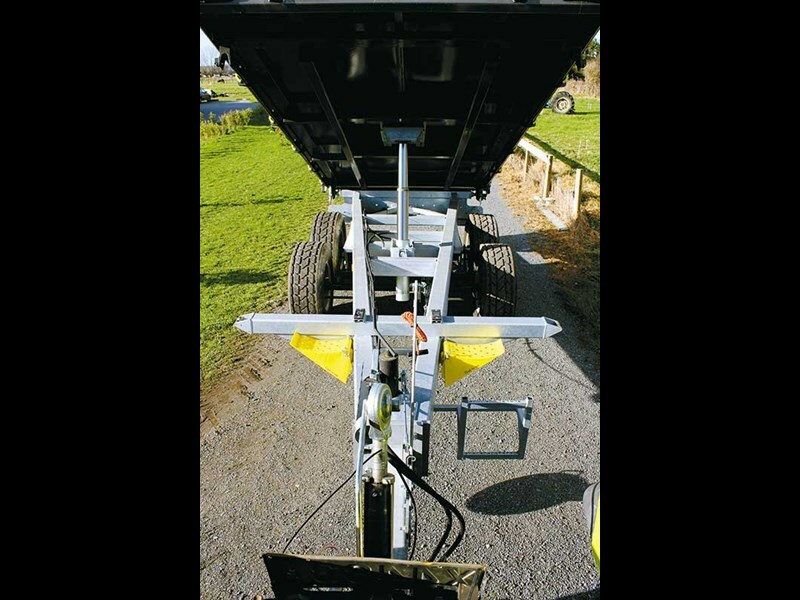 This simple, yet strong chassis gives the trailer a wide track and puts the tipping points out at the widest possible placement for increased stability, which is something that becomes evident when you begin side-tipping. Under the chassis, tandem axles run on a parabolic suspension setup which uses an inverted leaf spring on each side to allow each wheel around 300mm of individual movement to smooth out the bumps. Drum brakes are used on all of the wheels and were hydraulically operated on the machine tested, but as you would expect there is an option for air brakes. 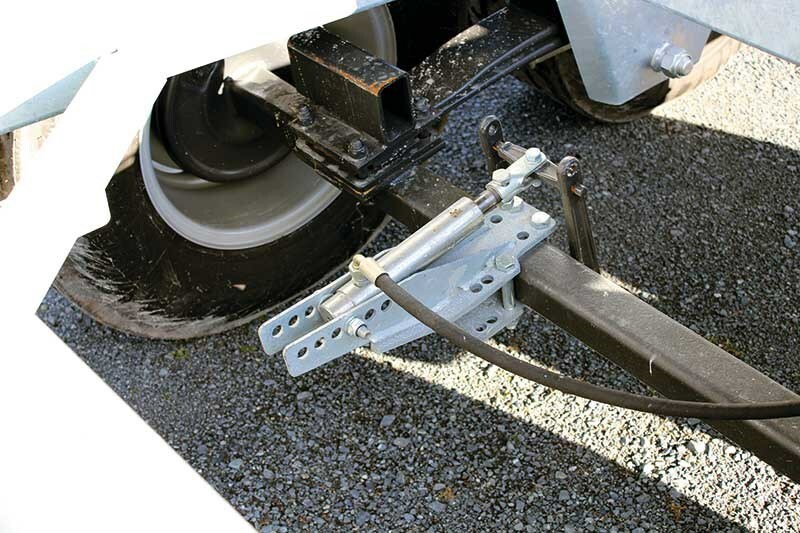 A mechanical hand brake is operated with a lever on the drawbar and provides safety when you unhitch the trailer. The Michelin 340/65 R 18 tyres fitted will, I’m sure, prove effective on the road although options of floatation tyres will appeal to those working in softer conditions. The axles and running gear are rated for 50km/hr speeds and above. The deck is well constructed of plate steel, as are the sturdy folded single piece panels that are used on all sides, and all (including the headboard) can be completely removed to create a flat deck trailer. A grain door on the back will be a popular inclusion for some, although if you’re serious about using the trailer for grain then you are probably going to want to invest in the optional extensions to get a decent sized load of grain on. 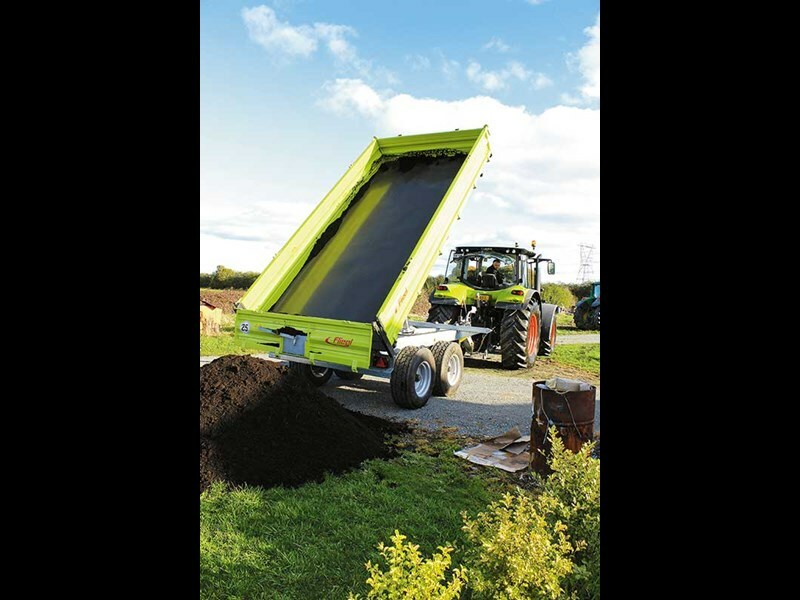 The sides and tailgate are hinged from the top with trips on the bottom allowing them the be used for spreading. The clever part is that the trips lock and double as a hinge enabling the sides to be folded down, which for example will make loading pallets then folding the sides back up simple. While manual mechanical trips on the side and rear tail gates are adequate, it does makes precise spreading tricky and also means you need to get out of the tractor twice; once to unlock the gate and again to lock the gate shut after you have tipped the load. 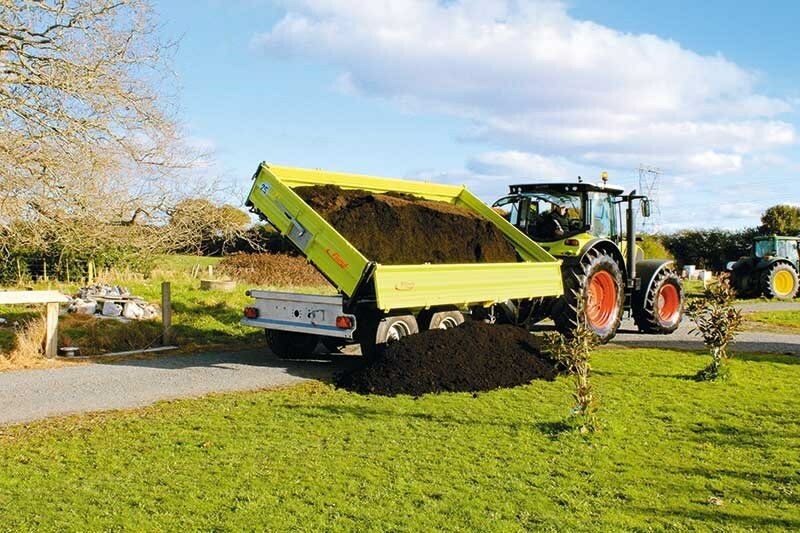 Tipping is where the Fliegl differs from almost all other trailers. The deck hinges at the two rear corners on large ball ends which are captured in a pocket with a pin. 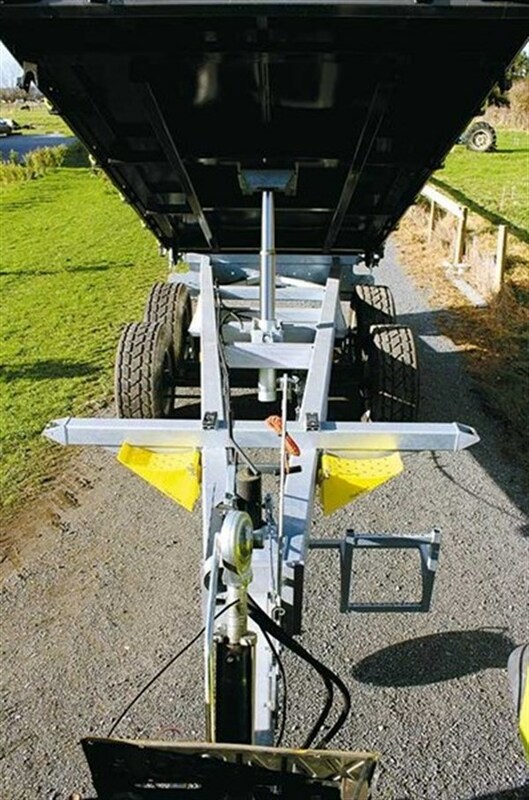 When the rams extend, the trailer will tip to the rear like any other trailer. To tip to the left or the right side, one of the pins that holds the ball end in the socket on the rear corner is removed and placed in a locking hole on the opposite front corner of the trailer to lock the front and rear corners on one side; and unlock the opposite corners so that when the ram is extended the trailer tips either to the left or the right depending on which pins are changed. A hefty four-stage hydraulic ram under the deck also uses some clever engineering allowing for three way tipping, the bottom mounts to the chassis in a gimbal setup which holds it steady while allowing to pivot in all directions and on the underside of the deck it uses a stainless steel ball joint for a similar effect. 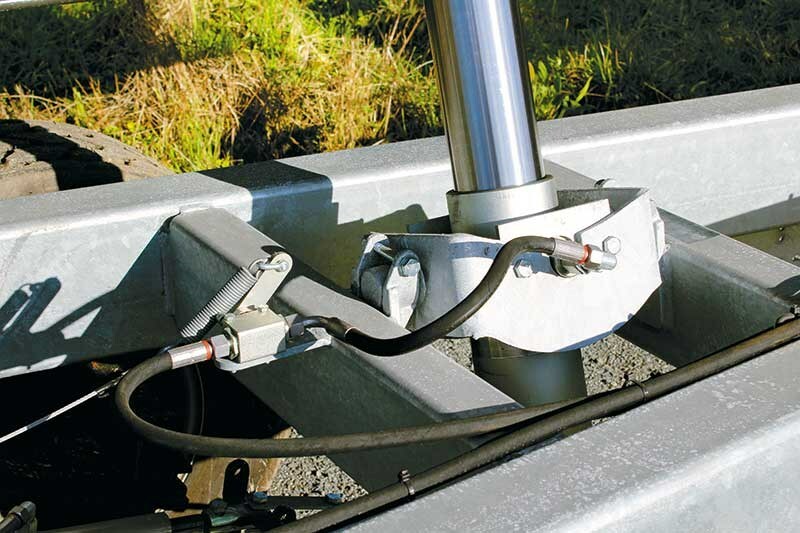 A simple mechanical cut-out valve in the hydraulic system is connected to the underside of the deck via a steel cable cleverly insuring the ram stops extending when the deck reaches a 55-degree angle. I was impressed that only 14 litres of oil is required to tip the trailer but being a European machine I was surprised that there was no anti-drop safety valve on the main tipping ram to prevent it dropping if a hose blows, although not mandatory here, it is becoming more common on hydraulic systems and offers peace of mind. Even if you’re only intending to use the Fliegl TDK as a regular trailer you’re still getting a very good machine. The deck is well constructed and the sides can be cleverly hinged from the top, the bottom or completely removed. The simple, yet robust chassis sets the tipping points out at the widest possible point which really improves stability and the galvanised finish will definitely increase its life span. The real selling point is the fact that for a similar purchase price to many other trailers of this size, you also get a three-way tipping, although many of you may be wondering if it is something that they would actually use. Simple easy to use three way tipping. Wide tipping points on the chassis for stability. Mechanical cut out on tipping ram at 55-degree deck angle. Manual mechanical tail gate locks (hydraulic is an option). No anti-drop safety valve on tipping ram if a hose bursts.